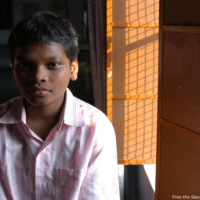 Ashok was trafficked into a carpet loom in Uttar Pradesh. 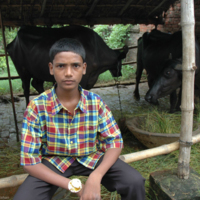 He was liberated by activists from Bal Vikas Ashram (BVA), an organization that liberates and rehabilitates child slaves. He and other boys were found weaving carpets, wearing only underwear, and had been forced to weave rugs for 12-15 hours a day, beginning at 6am. 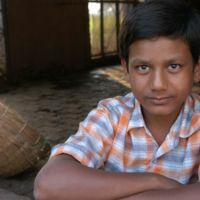 After their liberation, the boys were taken to BVA, in Uttar Pradesh, where they received medical care, counseling, literacy training, and basic rights education. They returned to their villages after six months. BVA continues to liberate children. I was fortunate to work for a little period at the loom compared to the other children. I came to the loom with one of the owner’s family members eight months before the date of rescue. As usual my father was tricked by a trafficker, through his false promises of a better future for me—food, education and income. I was sent with the man for just 2000 rupees [$45]. Due to the poor condition of the family and a huge debt after my brother’s marriage, I decided to go with the man to rescue my family from debt. It was a very fearful experience for me when I entered the loom, which was very dark. I was not able to see things clearly. I was amazed to see children working in such a miserable condition but now I was also part of it. I was forced to work in miserable conditions at the loom with no proper food to eat. I was provided with poor quality as well poor quantity of food. Sometimes there was no salt and sometimes a full packet of salt. The food was watery with no nutritious value and of such a bad quality that even animals would also not wish to eat it. I was made to work continuously from seven in the morning to seven in the evening. I got only one hour of break either to take rest or lunch. My master tortured me both physically and mentally. When I was not able to finish my work, I received beatings with slipper and bamboo sticks from owner of the loom. One day his torture crossed its limit, my both hands were tied to the trunk of the tree and I was beaten very badly. I was not able to come out of that situation for more than one and a half months. I felt that I had been so happy at my house. At the time of any illness and sickness such as fever, pain in my legs, hand, backbone, I was treated badly and also not given any proper care to recover from the sickness. I tried to escape from the loom but was caught by the owner’s father who used to do guard duty during the night. This made me very disappointed and very often I thought of my past days when I was free to play, free to go anywhere I wanted and enjoy my life in the field when I use graze my cattle along with my friends. I was not allowed to go anywhere, even when there was a problem in my family. I never got any leave. Whenever I asked for leave, the owner clearly said: “first return my money and only then you will be allowed to go home.” I was getting mentally depressed and used to get angry very quickly whenever I talked with other boys working along with me. But I was not able to understand what was happening to me. The world is too cruel for those who don’t have money and education hence I ask you to please support us and stop child labor. I hope I will become an army officer to fight for the children and my country. Please pray to God for my success. Narrative as told to Peggy Callahan and Supriya Awasthi for Free the Slaves, July 19, 2005, at Bal Vikas Ashram, in Allahabad, Uttar Pradesh, India.